Greensburg School visual progress report. 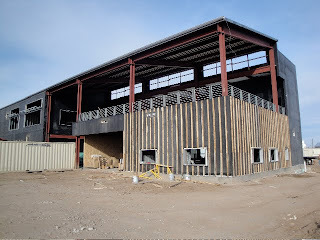 Here are a few images of where Greensburg School construction is currently and a little background information about our involvement with BNIM Architects in this project. "Poignantly, the project features siding created from 3,600 board feet of cypress salvaged from trees destroyed during Hurricane Katrina in Louisiana. Using disaster recovered wood means less harvesting of live, new wood. PlanetReuse also sourced materials for interior slat paneling, exterior bridges and walkways, including 72,000 lineal feet of reclaimed hemlock fir, 22,000 lineal feet of Douglas fir and quantities of a 2x6 pine/spruce/fir mix from the St. Louis, Missouri area." For more views of the structure throughout construction, join the PlanetReuse Facebook group and take a look at our work in the "Group Photos" section!